I am originally from Des Plaines, IL. I went to Oakton Community College, and then Columbia College in Chicago where I received a BA in Theater Arts. I moved to Las Vegas after college, and worked as a dealer and occasional pit boss at The Castaways. While working in the casino I learned to count cards, and after a few years I was making more money playing blackjack than dealing it, in one quarter the hours. What could I do? I had to quit the job. 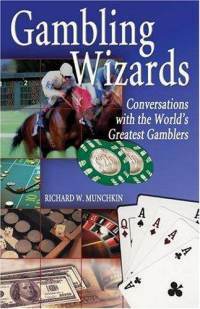 In the book I interview 8 of the top professional gamblers in the world. These are all people who have made many tens of millions of dollars from gambling. It includes, Billy Walters, Alan Woods, Doyle Brunson, and 5 others. Currently I cohost a podcast - Gambling With an Edge. Each week we have a guest, and discuss current gambling news, or ways to gain an advantage at lots of different gambling games. Here is a link to the Gambling With an Edge Facebook page. I post news articles there that are of interest to professional gamblers, as well as updates about upcoming guests. Meanwhile I have gambled my way around the world as a way to supplement my meager show biz income. I hope you find things here to enjoy. You can also check out my Facebook page at Richard W. Munchkin, follow me on Twitter @RWM21 or email me at rwmunchkin@gmail.com.